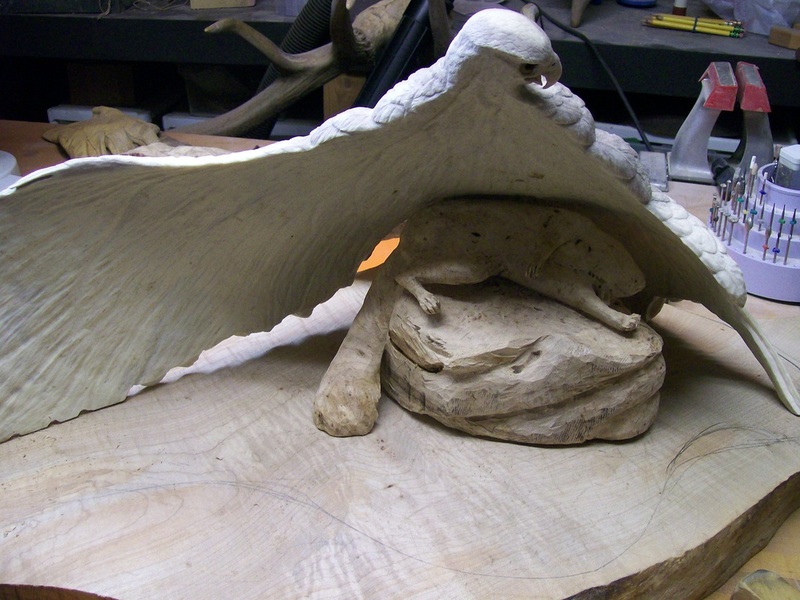 The first consideration in creating the mantling hawk was to find a suitable antler approximately the size of a Broadwing. 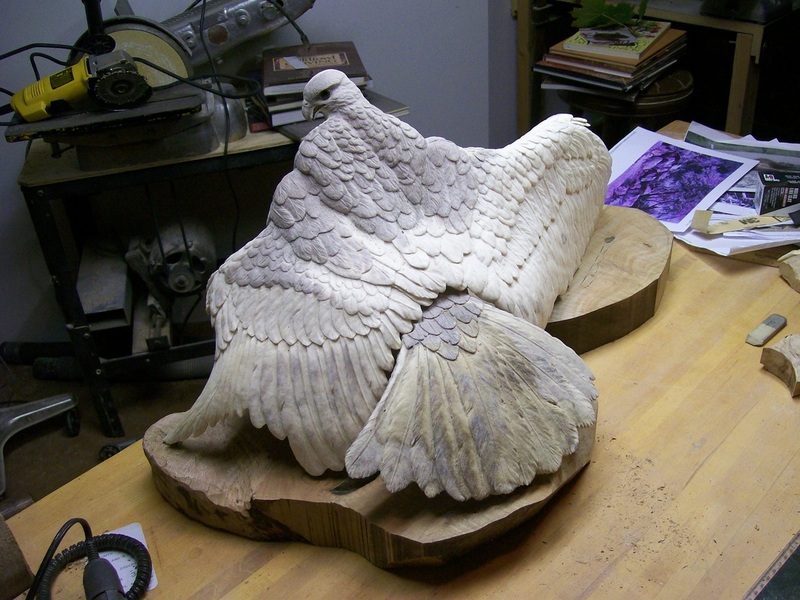 That requires a height of 13-15" and a broad shaped wing approximately 12" in length. 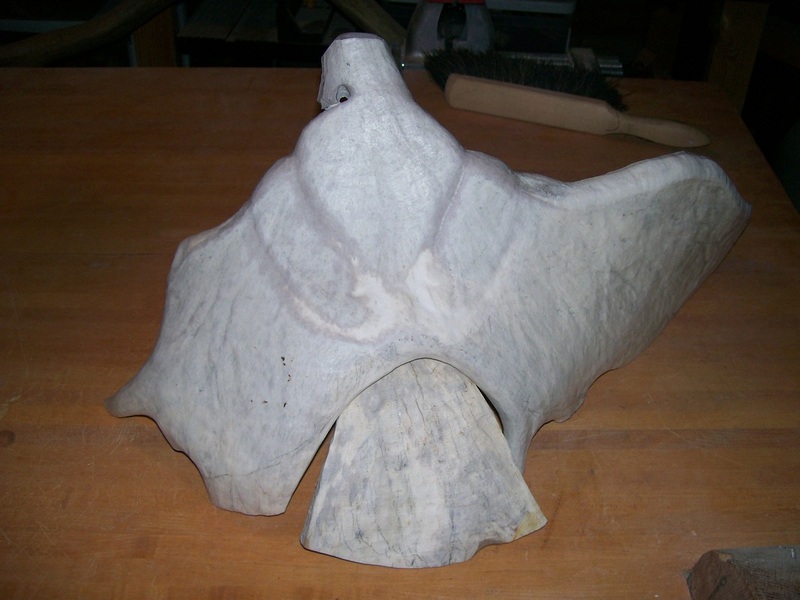 It also requires an antler that can stand alone on an angle sloping forward with sufficient material to create the head, a gentle arching sweep for the extended wing and a full palm with enough material for the opposing wing....and a maximum of only10" from front to back. 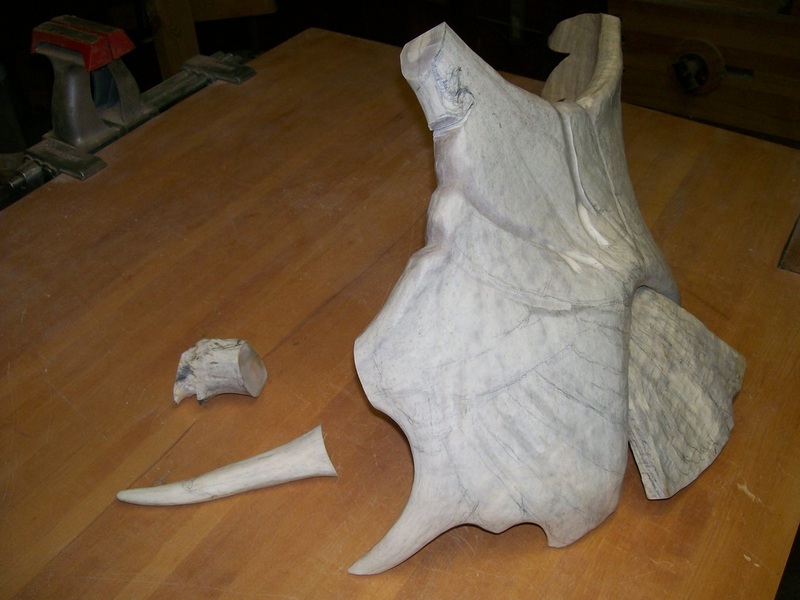 This photo shows the antler cut to stand on its own and the beginning of shaping the right wing. The hawk was to be looking up. After much pondering, I decided I need to change the original pose. 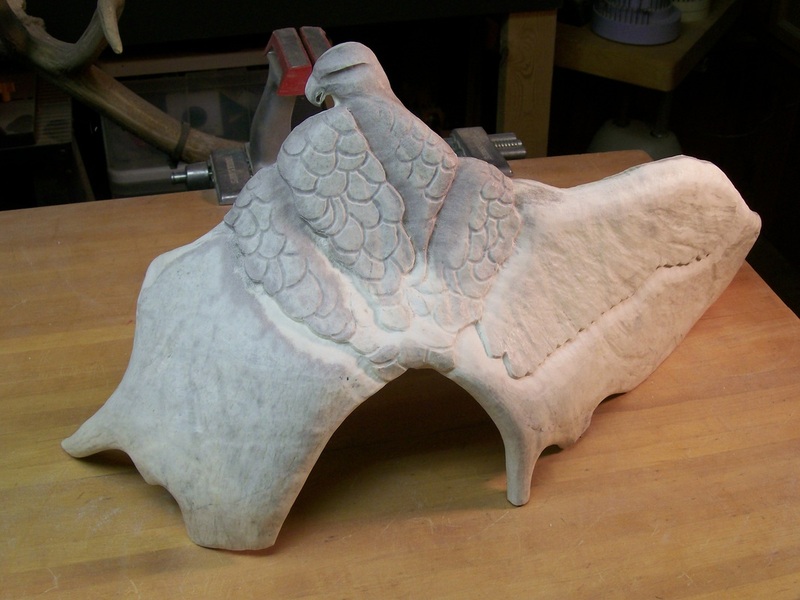 The neck was too long, too thin and just didn't feel right. 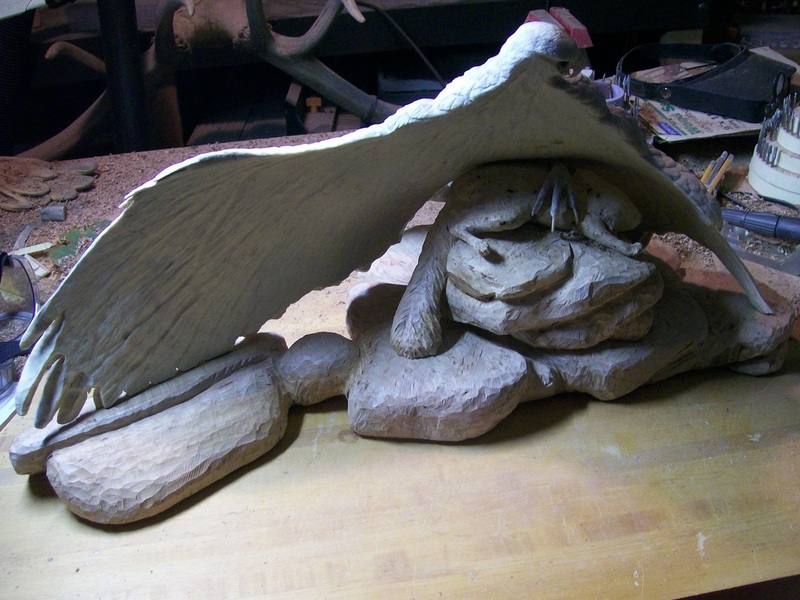 I reconsidered and cut off about two inches and also removed the long tine where the left wrist is located. 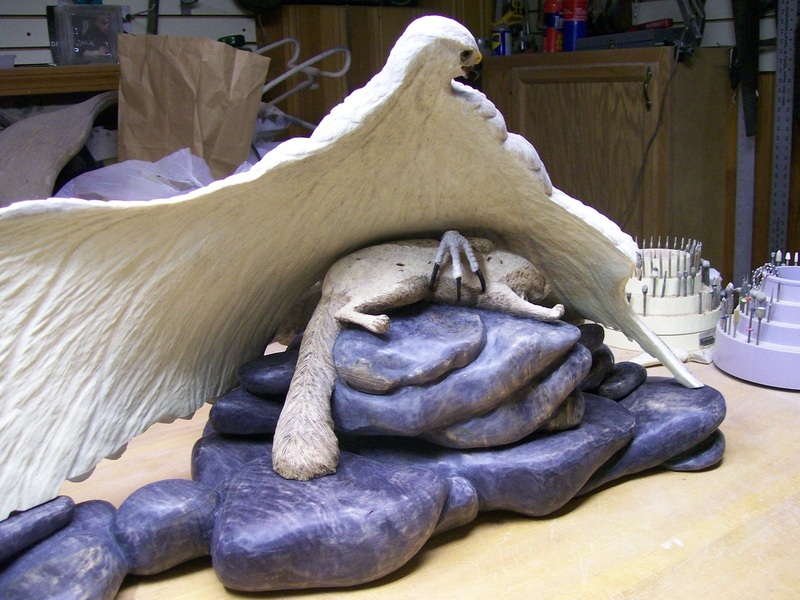 Because of the basic shape of the antler base, the bird will be looking left. Beginning to develop definition on the back musculature. 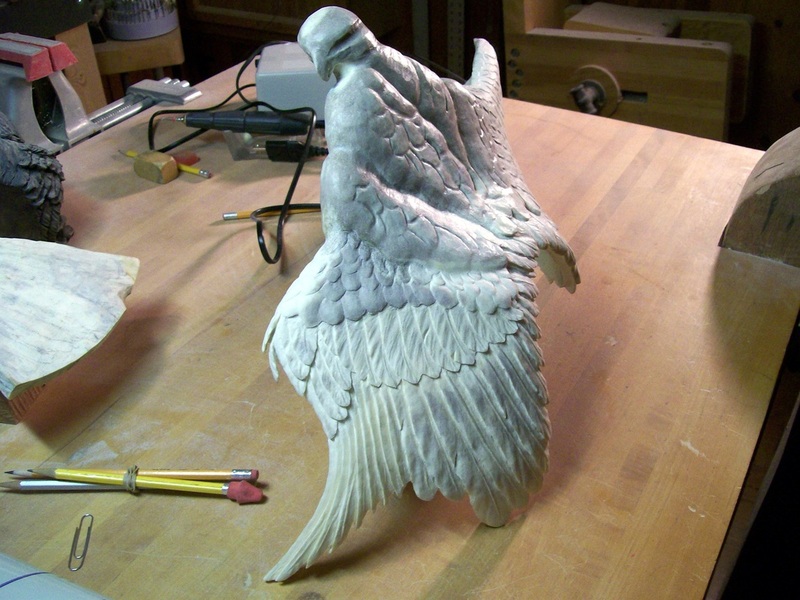 Birds of prey have large wings and a powerful muscular system which becomes very apparent in the mantling posture. 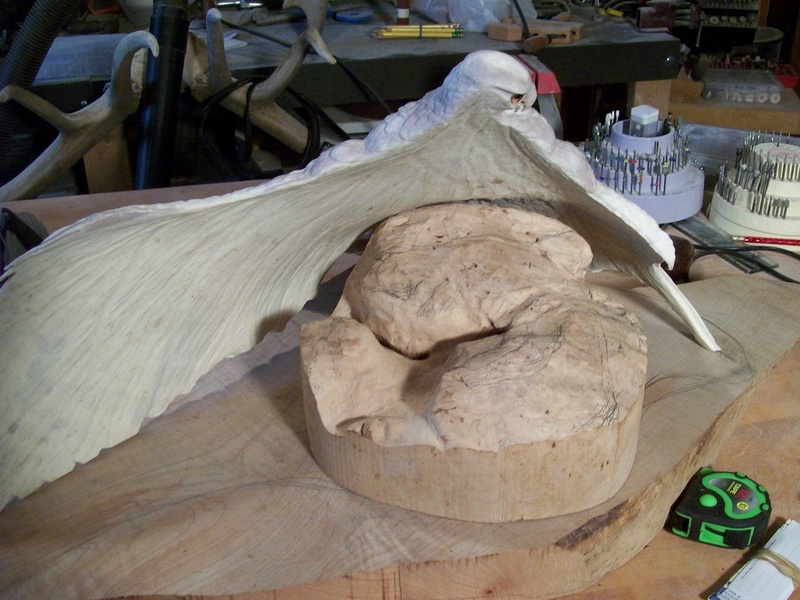 The head is in the initial stages of being formed. The head is coming around. 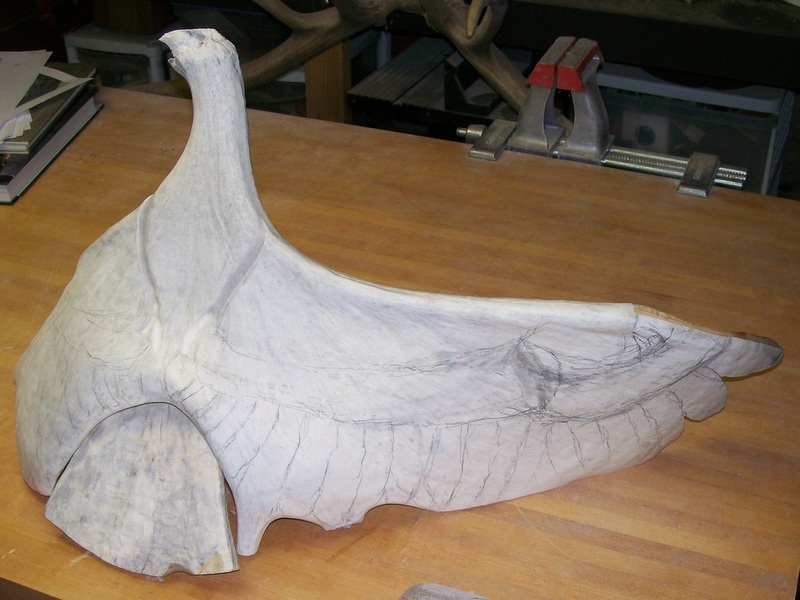 This photo shows the absence of a tail, which is a separate antler that will be shaped separately and afixed to the torso. 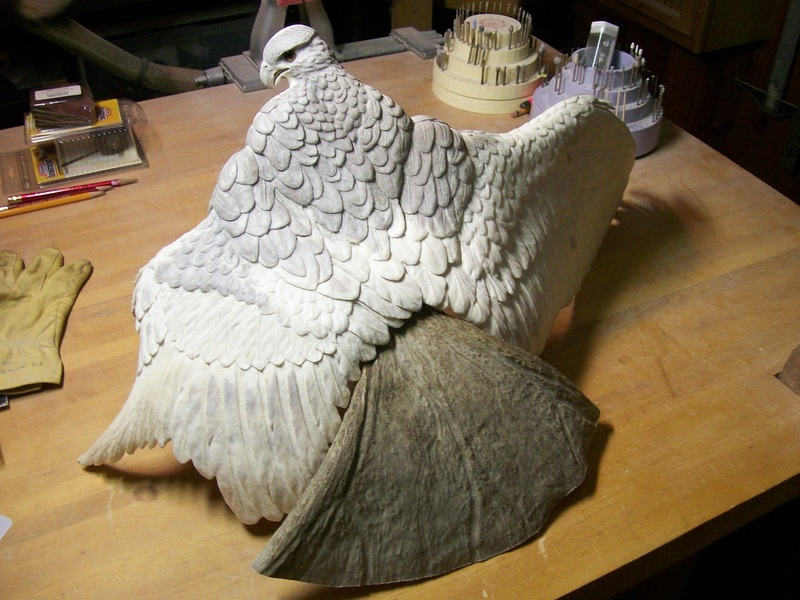 I am beginning to cut in the feather groups on the back and right wing. Even though the basic groups are defined, I will come back to show more definition after completion of the major groups. 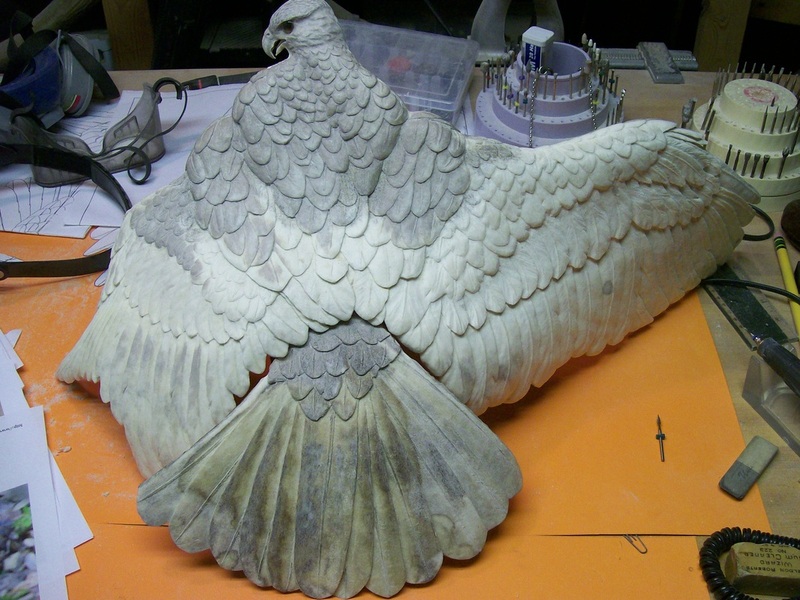 The left wrist needs more refinement and the primary feathers on the left wing present a particular challenge because the wing is not fully extended. Quills have been inserted on the primary and secondary feathers of both wings. 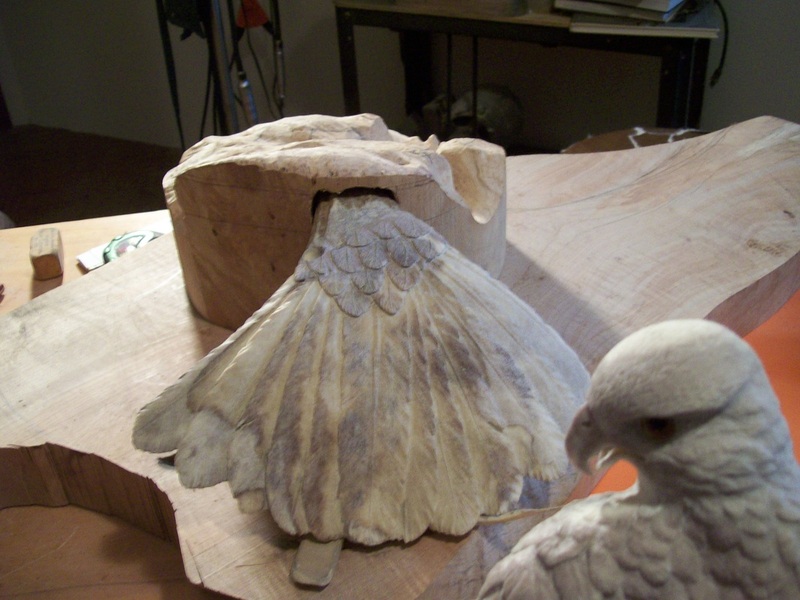 I have decided the two long secondary feathers on the right wing throws the symmetry of the wing off. I had originally left them to provide stability but stability will not be compromised and flow greatly improved. After extensive research, I was able to find a video that showed a hawk stretching its wing. The video provided enough information for me to design the partially folded left wing, complete with alula at the bend of the wrist. 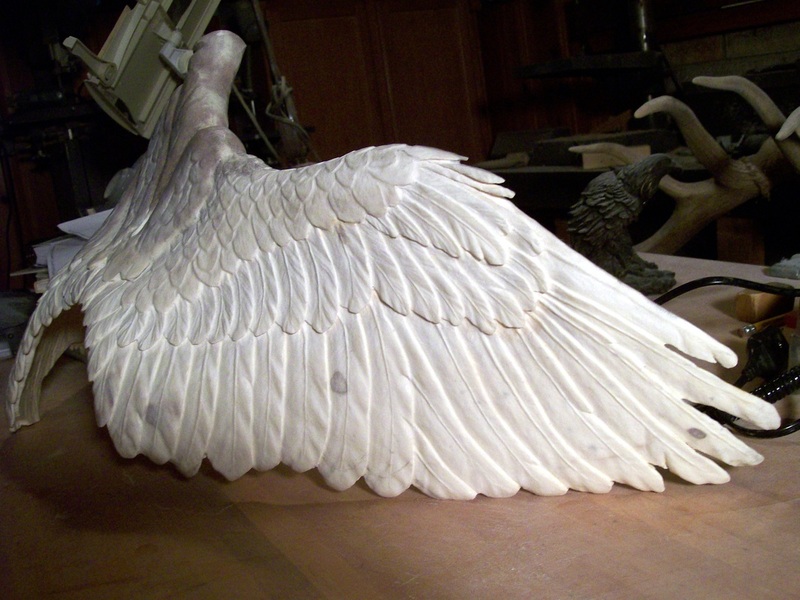 All major feather groups have now been defined on the right wing. The bird is beginning to show signs of life. I have now drawn and completed the initial shape of the lesser primary and secondary coverts on both left and right wings. 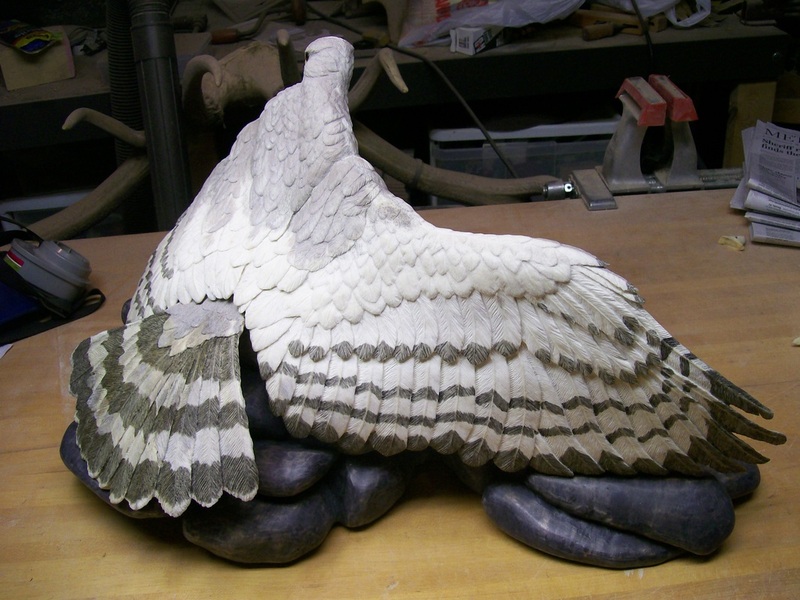 Detail is not finished yet, but the important process of reducing material and shaping feathers in this area is well under way. 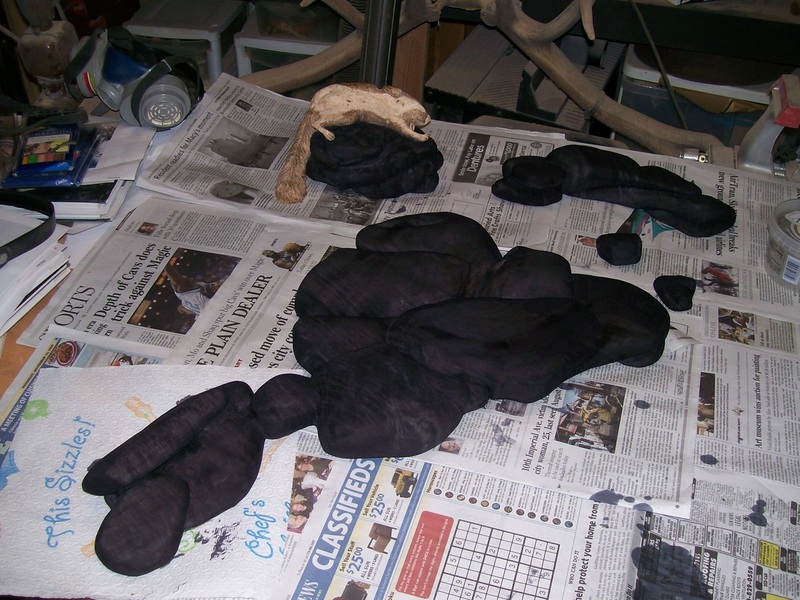 Next I will concentrate on the tertials and scapulars before detailing. The beak, cere and nares have been refined and the bird has sight. This is a crucial and exacting detail that must be done with care so the eyes "focus" on a common point. Distances between the beak and eyes must be measured and remeasured during the drilling process so the eyes are at the same level and look as they should. Piecing together the jigsaw puzzle.